Purchase on Amazon or contact us for bulk orders. 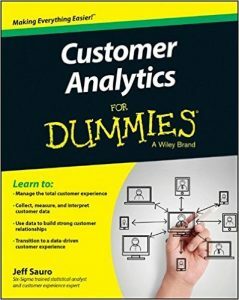 Customer Analytics For Dummies gets you up to speed on what you should be testing. You’ll also find current information on how to leverage A/B testing, social media’s role in the post-purchasing analytics, usability metrics, prediction and statistics, and much more to effectively manage the customer experience. Written by a highly visible expert in the area of customer analytics, this guide will have you up and running on putting customer analytics into practice at your own business in no time. Whether you’re part of a Customer Engagement team or a product, marketing, or design professional looking to get a leg up, Customer Analytics For Dummies has you covered.